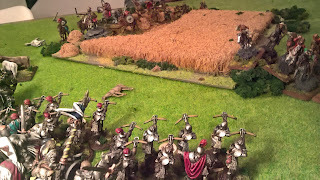 Home » Battle Report » Playing Saga: Hunnic invasion! It’s a cold morning when Ulric hears the sound of the hooves of galloping steeds. The towering blacksmith reaches for his warhammer and goes outside to have a look. A band of Hunnic tribesmen, intend on looting , advances at a rapid pace towards the small village. Suddenly a deafening war cry erupts from the woods around the village. “Deus vult! Montjoie Saint Denis! 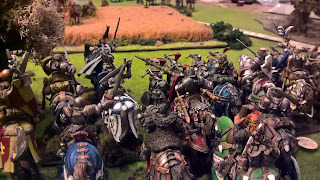 !” A contignent of valiant French knights and mercenary crossbowmen confronts the Hunns. 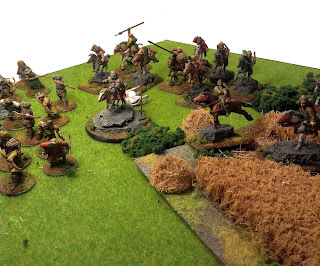 Hunnic archers enter the outskirts of the village and lay down a barrage of arrows. The Hunnic commander sends his swift horsemen into the fray. Their mission is to harass the knights so they won’t be able to launch a combined charge. But the swift horsemen are easily repelled by a volley of crossbowfire. Bloody combat erupts all around the village. Another wave of savage Hunns descends upon the French lines. French knights counter charge and cut down the horsemen. Casualties start to mount on both sides of the battlefield. Who will prevail?